The only ferry service from the Black Isle, travelling between Cromarty and Nigg. 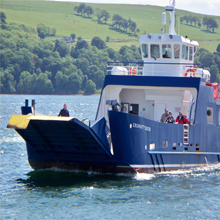 The service includes a 50 passenger and 4 car ferry and is one of the smallest car ferries in Britain. The ferry crosses the entrance to the Cromarty Firth, one of the finest natural harbours in Europe and also an area rich in wildlife and world-famous for its dolphin population.